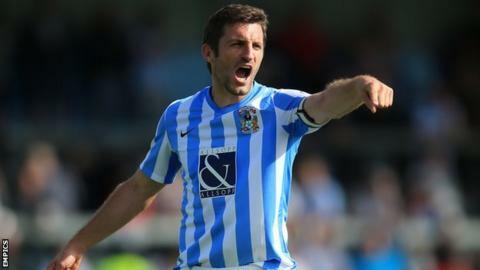 Coventry City have announced defender Sam Ricketts will captain the League One side this season. Wales international Ricketts, 33, has worn the armband in the final three pre-season games for the Sky Blues, following his summer move from Wolves. "I'll always be vocal and try and organise things," Ricketts told BBC Coventry and Warwickshire before the announcement was made. "I like being captain, I enjoyed it at Wolves and had a successful time." Ricketts, who captained Wolves to the League One title in 2014 and replaces Jim O'Brien as team skipper at the Ricoh Arena, outlined his approach to the role. In a 521-game career there is not much Sam Ricketts has not experienced. He has played in all four divisions of English football, and won promotion three times, including to the Premier League via the play-offs with Hull City in 2008. Ricketts also knows the downside, having been relegated from the top flight with Bolton in 2012 and twice losing a play-off final, the most recent during a loan spell at Swindon last season. He has experience of football at the highest level after winning 52 caps for Wales. "I'll just be myself and try and help the young players - I think you should do that whether you're captain or not," he added. Teenage striker Adam Armstrong is one such player, and Ricketts said he was confident the 18-year-old loan signing from Newcastle could make an impact. "It's his first loan move so it's a big learning curve for him," he said. "He's got talent and we need to help him and not put a lot of pressure on his shoulders - he's already settled in well and hopefully he can click with the rest of the forwards and have a good season."